These fall colors looks great on you. I love the mustard shades you added to your outfit, perfect for October! I am really digging the mustard and green combo, Mica. You look great as always in both outfits. 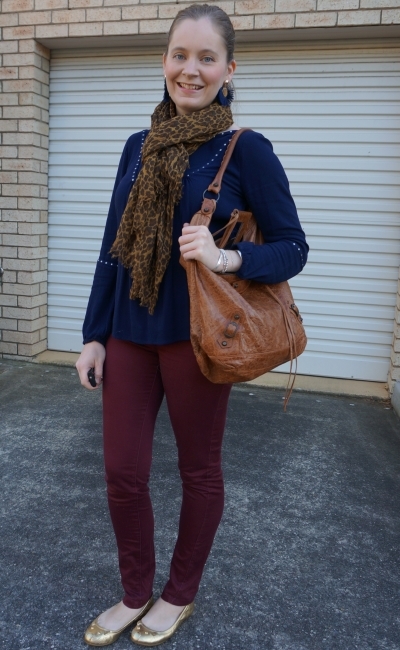 The blue and burgundy are indeed perfect fall colours:) And totes can see why u got so many compliments on that scarf. Really brightens up an outfit. Both outfits have their own attraction. I'm really impressed with the first outfit. The way you have paired your dark green pant with black cardigan and yellow scarf is really amazing, the second outfit is also very cute. I loved your video as well. Great job dear. I need more colorful pants in my closet! Both of these combos are so pretty! I love your mustard scarf! Hope your week is off to a great start! Your burgundy pants are fabulous! It is always nice when you've got a flexible work dress code and can really make it work for your needs and your style. 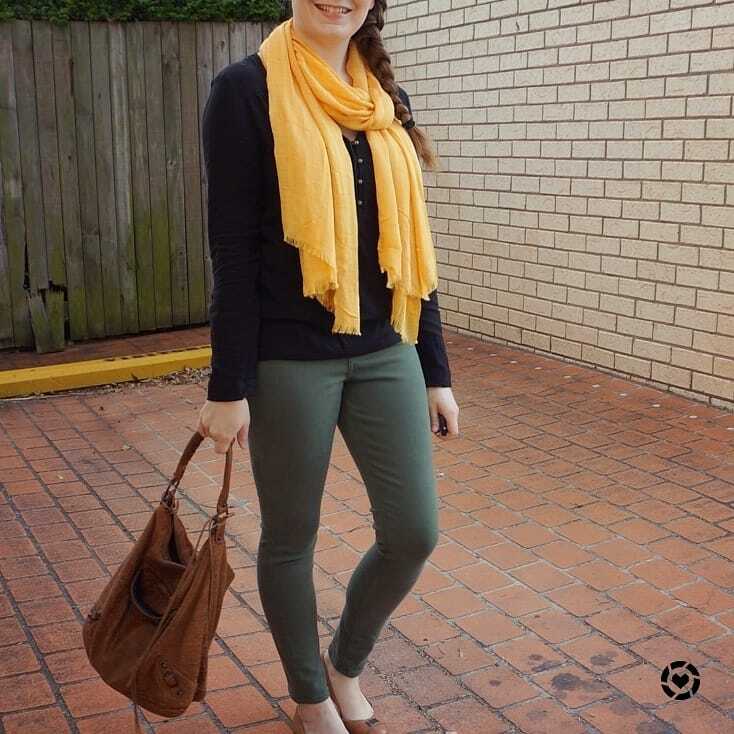 I love how you paired yellow with this color green and I love the leopard print scarf! Oooh that second look is totally my color combo! Love me some leopard and burgundy! Navy and burgundy are beautiful together! I also love the pop of color from the scarf! Ahh I wish we had more fall weather here! You wearing this colorful denim have totally made me question my coloured denim ! haha glad I could inspire you! I'm surprised how much green I have in my wardrobe now actually! You wear colored pants like it's nobody's business! I love both of these business casual looks! These colours are so pretty and they look SO good on you! Love it. I am loving the colored pants this fall! YOU look great in them! Thanks for sharing, hun! I love the olive with the yellow - what a fabulous colour combo. The tan accessories are perfect. I also really like the navy/burgundy/leopard mix. Excellent business casual outfits, Mica! Would you believe my office is also business casual? Most people would not guess, based on my outfits! I think you nail business casual, professional and stylish when you go to work each day! :) Sometimes I dress a little casually, but not all weeks involve many important meetings! I think that's smart to have a blazer nearby just in case. But really these outfits are fabulous! I especially love the leopard scarf! Yes, always a good idea to have something like that just in case! That scarf is a wonderful and vibrant colour! Perfect for autumn! You do business casual very well. Wear I work is also business casual and it does make it easier to get dressed in the morning. Love the yellow scarf! Loving the second outfit. You sure know how to rock colored jeans. I hope you have a great week. We just stay in this past weekend. This first look is definitely one of my favorites of yours. 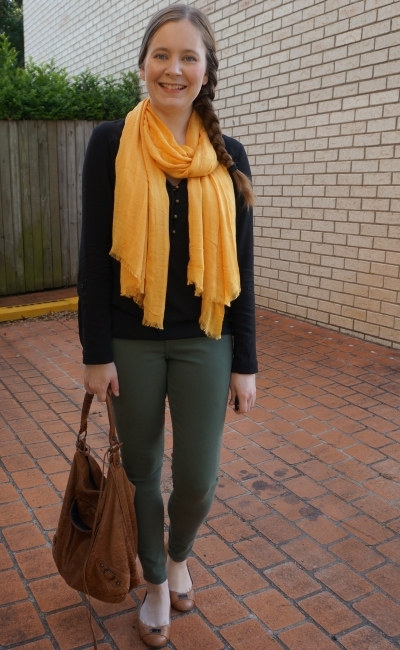 I love the darker colors and then with that mustard scarf it's perfect! We don´t hae a strict dress code either, I could technically show up in denim and a tee, but I have impromptu press events and meetings with my superiors that require a certain dress code. I tend to dress up for the office, but for those days when I went a little more casual I have an "emergency blazer" in my wardrobe at work. An emergency blazer is a good thing to have! I'm not really customer facing so I do have more leeway with what I wear! Both outfits are beautiful! 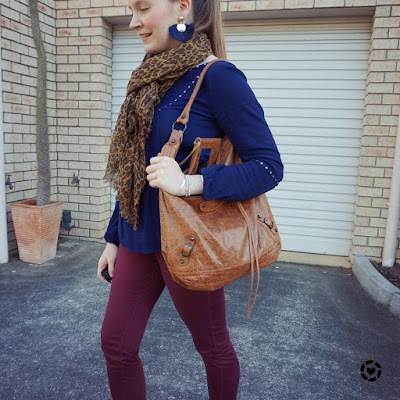 I love the combination of the bright scarf with the darker colors in the first look and all the lovely rich tones in the second look work so well together. Your look great! I really love the first outfit! That scarf and the bag go together perfectly, and I really love the sunny yellow look. I definitely always have a backup blazer in my office, though it rarely ends up being needed. Oh this is funny, Mica! I'm posting a VERY similar outfit to your first one tomorrow. And I *also* just got a pair of olive jeans!! Love your wine-colored pants too. Gorgeous color! I love how you incorporate color and print in your wardrobe. I have an olive pair of jeans and really love them too! 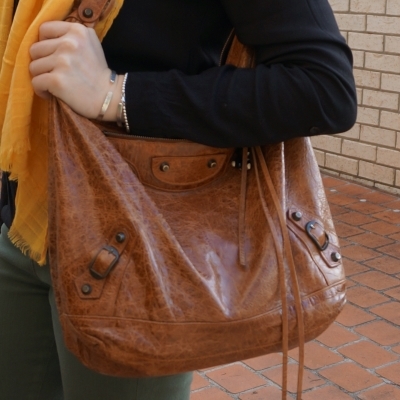 Looooove this bag!!! And I walked away from olive pants last week and am totally regretting it after seeing yours. So cute! Hopefully you can find another pair! I love these nes, but took me a while to track them down! I love all of the color you incorporate into all of your looks! These colored pants are fabulous! Ahhh, I always love the return of spring weather each year, and the return of COLOR to my outfits! Looking good here, lady- polished and chic! I think it is an huge advantage if one has some leeway corresponding outfits at the own workplace - lucky you! I like both of the looks you show here and I'm not surprised you got many compliments for the yellow scarf. And you got perfect inspiration from the American bloggers as I also love your second look. This navy with the burgundy works so well together with the camel shade. Kudos to you that you take always pictures although you are so busy each morning. Thanks for that. Thanks Rena - it's part of my routine to take photos now so it doesn't take long at all !I've been doing it for a few years so I've gotten lots of practice, haha! I love the purple pants. You're lucky - I have to wear an awful suit uniform! Oh I had that in a job for a few years, a bit of a pain! Does make getting ready each morning easier though, haha! You are really elevating the business casual look. You always have a wonderful eye for color combinations, and this particular post is no exception. Burgundy and navy added to leopard!! Fabulous!!! Loving the pop of yellow on you girl! Yellow is actually a happy colour and I feel like this scarf matches you so well! It really is! Nice to take advantage of the casual side of things! I have seen you wearing a few coloured jeans but by far my favourite has to be this olive green! It's so gorgeous and I think it's easier to style too. Thanks Shireen! They are a great addition to my colourful jeans wardrobe, haha! Mica you chose 2 of my favourite shades for coloured pants! I love burgundy and I love khaki green! You nailed it! Hope you're well and enjoyed Halloween! You look fantastic in these outfits...you nailed Autumn coloured looks. I follow bloggers from all around the world, from USA too, bloggers are always a great way to look for inspiration. I have quite a few pairs of colored pants that I used to wear to work. They've been neglected! You are inspiring me to pull them out! 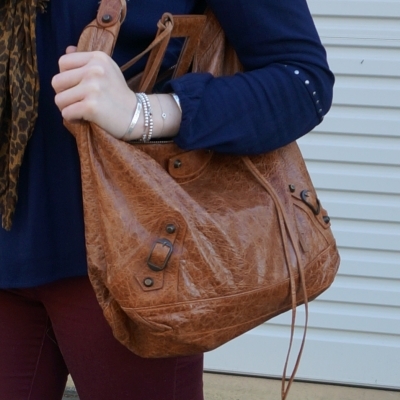 I could easily recreate your second look and wear it for running errands! Love it! Both color combinations of these outfits are lovely! I always love how you style colored pants. The navy and burgundy together looks great and is something I'm going to try this fall. You've definitely nailed business casual!